The HTML Color Code Generator provides an interface for generating those hexadecimal numbers (preceded by a '#' character) and named colour constants that web browsers understand. 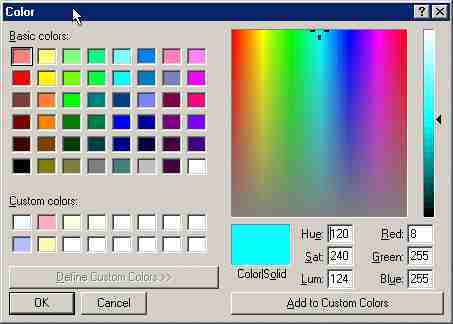 Click on the 'palate' button or in the coloured box at the top to open a Windows standard colour picker (it looks like this). Choose your colour and the HTML hex colour code appears below along with the named colour constant of the colour you have chosen matches with one of the pre defined constants. Click the 'copy' button (or right click and select copy) to copy the colour code or constant into the windows clipboard. For those who want to it also works the other way around: I.e. type in a #followed by a six digit hexadecimal number and it shows you the colour for the number. Alternatively just choose one of the named colour constants from the drop down list and WMW will show you the hex code and display the colour.